I used to work in radio, and I have always been fascinated with audio recording and production. 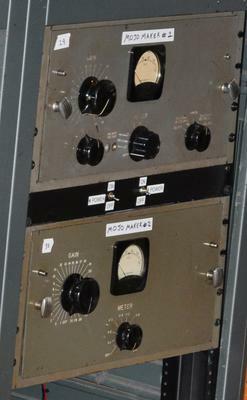 On a tour of RCA Studio B in Nashville, I saw two "Mojo Makers" in a rack of processing equipment. They are obviously custom-built, and I have been unable to discover what these devices do. They both have a Gain control and a meter switch which has positions of Off, V1, V2, V3, V4, V5 and V6. The meter face says "Test," and has a range from 0 to 50. The top unit has two other controls. One is unlabeled; the other is unreadable. Does anyone know what these "Mojo Makers" are and how they were used? Join in and write your own page! It's easy to do. How? Simply click here to return to Outboard Recording Equipment.